We frequently use the familiar term, gospel, or good news. Where is the first place it appears in the Bible? The answer may surprise you. The Gospel hidden in Genesis is a great surprise tucked away in the original Hebrew that is untranslated in the proper names. Genesis 5! The great discovery is that the Bible is a message system: it’s not simply 66 books penned by 40 authors over thousands of years, the Bible is an integrated whole which bears evidence of supernatural engineering in every detail. The Jewish rabbis have a quaint way of expressing this very idea: they say that they will not understand the Scriptures until the Messiah comes. But when He comes, He will not only interpret each of the passages for us, He will interpret the very words; He will even interpret the very letters themselves; in fact, He will even interpret the spaces between the letters! “Think not that I have come to destroy the Torah and the prophets; I have not come to destroy but to fulfill. A remarkable example of this can be glimpsed in Genesis Chapter 5, where we have the genealogy of Adam through Noah. This is one of those chapters which we often tend to skim over quickly as we pass through Genesis it’s simply a genealogy from Adam to Noah. But God always rewards the diligent student. Let’s examine this chapter more closely. In our Bible, we read the Hebrew names. What do these names mean in English? The meaning of proper names can be a difficult pursuit since a direct translation is often not readily available. Even a conventional Hebrew lexicon can prove disappointing. A study of the original roots, however, can yield some fascinating insights. Methuselah’s father was given a prophecy of the coming Great Flood, and was apparently told that as long as his son was alive, the judgment of the flood would be withheld; but as soon as he died, the flood would be brought or sent forth. It is interesting that Methuselah’s life, in effect, was a symbol of God’s mercy in forestalling the coming judgment of the flood. Therefore, it is fitting that his lifetime is the oldest in the Bible, speaking of the extensiveness of God’s mercy. 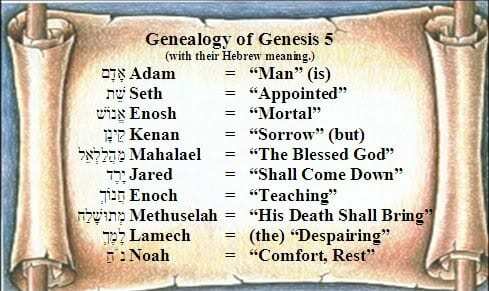 If there is such significance in Methuselah’s name, let’s examine the other names to see what may lie behind them. Adam’s name means man. As the first man, that seems straight forward enough. Seth’s son was called Enosh, which means mortal, frail, or miserable. It is from the root anash, to be incurable, used of a wound, grief, woe, sickness, or wickedness. We have no real idea as to why these names were chosen for their children. Often they may have referred to circumstances at birth, and so on. Kenan’s son was Mahalalel, from Mahalal which means blessed or praise; and El, the name for God. Thus, Mahalalel means the Blessed God. Often Hebrew names include El, the name of God, as Dan-i-el, “God is my Judge”, etc. Enoch was the father of Methuselah, who we have already mentioned. Enoch walked with God after he begat Methuselah.8 Apparently, Enoch received the prophecy of the Great Flood, and was told that as long as his son was alive, the judgment of the flood would be withheld. The year that Methuselah died, the flood came. Enoch, of course, never died: he was translated 9 (or, if you’ll excuse the expression, raptured ). That’s how Methuselah can be the oldest man in the Bible, yet he died before his father! Methuselah’s son was named Lamech, a root still evident today in our own English word, lament or lamentation. Lamech suggests despairing. Lamech, of course, is the father of Noah, which is derived from nacham, to bring relief or comfort, as Lamech himself explains in Genesis 5:29. The implications of this discovery are more wide spread than is evident at first glance. It demonstrates that in the earliest chapters of the Book of Genesis, God had already laid out His plan of redemption for the predicament of mankind. It is a love story, written in blood on a wooden cross which was erected in Judea almost 2,000 years ago. The Bible is an integrated message system, the product of supernatural engineering. Every number, every place name, every detail every jot and tittle is there for our learning, our discovery, and our amazement. Truly, our God is an awesome God. It is astonishing to discover how many Biblical controversies seem to evaporate if one simply recognized the unity the integrity of these 66 books, penned by 40 authors over thousands of years. It is remarkable how many subtle discoveries lie behind the little details of the text. Some of these become immediately obvious with a little study; some are more technical and require special helps. Many of these discoveries are described in our Audio Book, Beyond Coincidence. Several are also highlighted in our Audio Book, The Creator Beyond Time and Space. Look behind every detail: there’s a discovery to be made! God always rewards the diligent student. What other messages lay hidden behind the names in the Bible? Check it out.